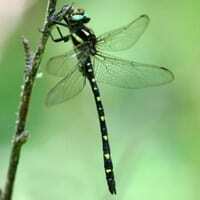 Cordulegaster maculata, also known as the twin-spotted spiketail, is a dragonfly of the family Cordulegastridae. Its body length varies in size from 2.5 to 3.0 inches. It was described by Edmond de Sélys Longchamps in 1854.